Muhammad Ahmed Qanitah. Image from the Ibn Taymiyyah Media Center’s Facebook page. A Palestinian jihadist military trainer and commander who was a member of the Tawhid and Jihad Group in Jerusalem and who previously served with Hamas was killed in Syria while fighting for the Al Nusrah Front for the People of the Levant, al Qaeda’s affiliate in the country. 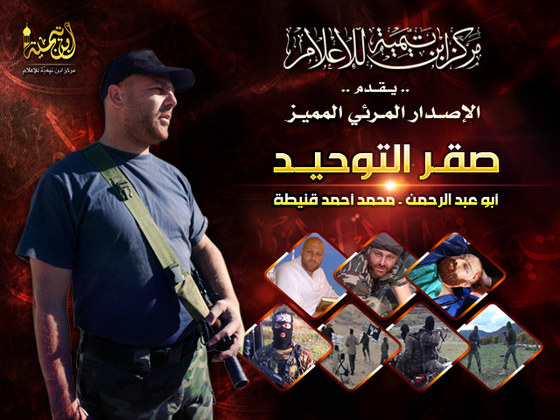 The Ibn Taymiyyah Media Center, “the official source for releases from the Mujahideen Shura Council (MSC) in the Environs of Jerusalem,” according to the SITE Intelligence Group, released a video to jihadist forums on March 12 about Muhammad Ahmed Qanitah. Qanitah, who is also known as Abu Abdul Rahman, was killed in a rocket attack in December while fighting for the Al Nusrah Front during the siege of the airport in Aleppo, according to the videotape. The narrator of the video said Qanitah joined Hamas’ Izz ad-Din al-Qassam Brigades of Hamas in 2003. “He came to know its leaders and worked with them and trained its fighters, and he participated in many jihadi actions and attacks against the settlements.” He fought against the Israeli military during Operation Cast Lead in Gaza in 2009, “and he continued participating in al-Qassam Brigades and the ‘cleansing’ of Gaza to live under Shariah-based governance,” the SITE summary said. Qanitah is not the first Palestinian jihadist to have been killed during fighting in Aleppo. Last July, a Palestinian fighter from the al Qaeda-linked Army of Islam was killed during fighting in Aleppo. In recent weeks, numerous press reports have indicated a rise in the number of Palestinians joining the fight against Assad in Syria. Many of those traveling to Syria have been Salafi jihadists who joined the Al Nusrah Front. Salafi jihadists in the Gaza Strip have expressed support for the fight in Syria and provided military tips in statements issued over the past couple months. The MSC has taken responsibility for a number of rocket attacks against Israel as well as the June 18, 2012 attack that killed one Israeli civilian. In November 2012, the group carried out joint rocket attacks with the Army of Islam. Following the institution of a ceasefire that ended Israel’s Operation Pillar of Defense, the MSC said that it was not truly a party to the ceasefire. In November 2012, the Israeli Air Force targeted a number of MSC members. On Oct. 7, the IDF killed Tala’at Halil Muhammad Jarbi, a “global jihad operative,” and Abdullah Muhammad Hassan Maqawai, a member of the MSC. Maqawai was likely a former member of Palestinian Islamic Jihad. On Oct. 13, Israel killed Abu al Walid al Maqdisi, the former emir of the Tawhid and Jihad Group in Jerusalem, and Ashraf al Sabah, the former emir of Ansar al Sunnah, in an airstrike. The two men were said to be leaders of the MSC. The Tawhid and Jihad Group in Jerusalem announced its formation in a statement released on jihadist forums in August 2009. In the same announcement, the Tawhid and Jihad Group in Jerusalem denounced a raid by Hamas against a Jund Ansar Allah mosque that killed Latif Moussa. Hamas killed Moussa and several followers after he declared an Islamic emirate in Gaza and challenged Hamas’s authority. Al Maqdisi had studied under Moussa. In addition, the terror group has expressed solidarity with the Islamic Caucasus Emirates, al Qaeda’s affiliate in southern Russia, and eulogized Emir Sayfullah, who was the terror group’s top judge was well as its leader in Dagestan before he was killed in August 2011.